Keep your garden 100% organic – learn how to make your own powerful organic slow release & liquid fertilizers using your new supply of worm castings! Tomato plants grown in worm castings (worm poo) grow 3 times faster than those grown in potting mix alone. It’s powerful stuff! Worm composting is environmentally friendly reducing green waste going to landfills. Use what nature created (composting worms) to power new life into your garden. ...In my opinion, this is the best worm composting manual that I've seen, and I have several, going back to the 1970's. It is concise and well-constructed, authoritative, yet readable, and very comprehensive. It is well worth the read. ~ George W.
> Here’s how YOU can turn your hobby into a second income! 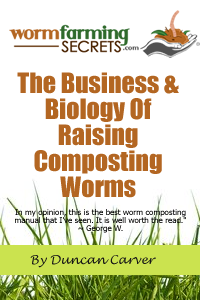 …"The Business & Biology Of Raising Composting Worms" has been produced in digital (PDF) format, so it’s available for you to download to your computer and read right now, even if it’s 2 am in the morning. You will be able to download the book immediately after payment has been made and you've completed registration for our private customers area (a 30 second process).